“Being here reminds me who I am and what I care about.” was the remark that rang true for all Boettcher scholars and family that I spoke to this weekend. As a current Boettcher Scholar, I was excited to take advantage of the many opportunities the weekend offered. 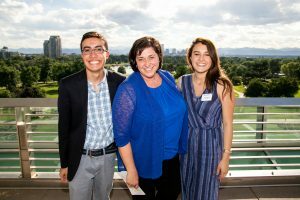 From connecting with old friends to forming new connections, the vision of the Boettcher Foundation to create more relationships and watch impact grow in Colorado is well under way! The event was nothing short of amazing. 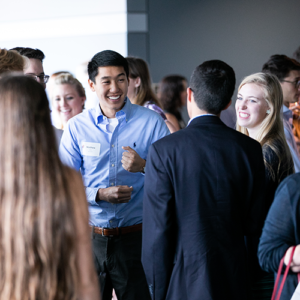 Opening night took place at Wynkoop Brewing Co. We heard about the future of the Boettcher Foundation from president and CEO Katie Kramer and members of the Boettcher Scholar Alumni Board. For many 2018 scholars in attendance, it was their first introduction into a community that is exciting, dynamic and very welcoming. I was able to meet amazing mentors who spoke to me about their careers, relationships and philosophies. They were genuinely interested and excited to hear about my career aspirations and give me all the advice they had. I was reminded of the uniqueness of the Boettcher community; scholars are not competitive with one another and genuinely want to see one another succeed. The Signature Event continued the next morning at the Denver Museum of Nature & Science. After breakfast, scholars entered the auditorium to hear TED-style talks from scholars including a psychiatrist, a voice actor, an elementary school teacher, a researcher and idea incubator from New York City and an education consultant. It was awe-inspiring to witness the far-reaching impact scholars are making in the world. From advocating for mental illness, immigrant communities and reminding us all about the child within us, Boettcher Scholars are touching countless lives all over the country. This is what it looks like to make your mark, bringing hope to the hopeless, bringing light and joy to a room of children and teaching those around you to become leaders. The talks were energizing and inspiring. The fun continued with my favorite part of the weekend: a wild and competitive game show with all the scholars and their family members. On Sunday, there were multiple excursions to choose from. I couldn’t choose, so I signed up for two. In the morning, I went on a VIP tour of the Denver Broncos stadium. The energy was high as we got exclusive access onto the field, into the Broncos locker rooms, security rooms with top-of-the-line technology and the most luxurious suites in the stadium. Later in the evening, I took a tour of downtown Denver and Union Station, learning all about the Boettcher family’s history and entrepreneurship in Colorado. I left the weekend with so much gratitude and renewed excitement to make my mark on this state, knowing that I am part of a team and legacy that is one of a kind! I can’t wait for the next signature event!